Monday was a great example of the importance of defining what you are talking about. Ed Miliband gave a speech announcing that the Labour Party would create 80,000 high-quality apprenticeships a year in England should they get into power. The Conservatives argued that they would create 3 million apprenticeships by 2020. You would think that it would be easy to suggest that Labour’s expectations were thus extremely low. But a closer look will tell you that the truth is exactly the opposite. The apprenticeships that Labour are talking about are aiming to be the equivalent of a student with good academic grades going to university. Their prestige will be enhanced by the need to achieve certain qualifications (equivalent to two A-levels) to get on an apprenticeship, for the apprenticeship to last for two years, and that they will focus on new job applicants only. They want to guarantee that a school leaver who achieves the grade will be guaranteed one of these apprenticeships if they want them. A new civil service apprenticeship scheme will be created, and anyone bidding for a large government contract will need to offer these high-quality apprenticeships. This means that if the investment in HS2 (High Speed Rail 2) infrastructure goes ahead there would be some 33,000 apprenticeships created. It will also be funded by money being diverted from the funds that have been earmarked for Labour’s jobs guarantee for young people who have been unemployed for over a year, which would come from a levy on bank bonuses that they have already promised. The Tories responded by pointing out that they have created 2.1 million apprenticeships during the course of the last Parliament and would create 3 million in the next Parliament. 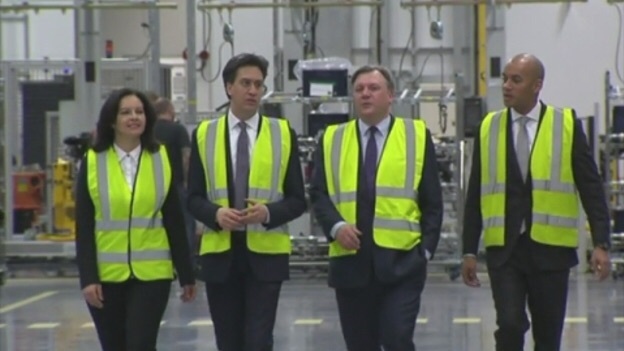 But Miliband was ready for that, retorting that the ‘apprenticeships’ created under the Coalition governments were in fact rebadged internal training schemes, in which people already working for the company. Labour quoted research by the Department for Business that showed that two-thirds of companies recruiting apprentices from existing staff don’t consider these qualifications to be apprenticeships at all. Furthermore, the proportion of apprenticeship started made by 16-24 year olds has fallen from 82.3% to 63.2% under the coalition, and 93% of apprentices over 25 years old already worked for their employer before starting their apprenticeship. Miliband also complained that at present just one in 10 employers in England offers an apprenticeship, saying this is six times fewer high-quality apprenticeships than Germany, a country where there is higher GDP per capita AND less inequality. The reaction of the Tories shows that Miliband is onto something. Their answer lacks coherence, and contains the usual lazy name-calling and point-scoring that the Tories resort to when they don’t have a good answer. Grant Shapps, the Conservatives’ Chairman, merely said that we shouldn’t be listening to someone “who has never run a business in his life.” Advantage Labour then.